RIO DE JANEIRO, Dec 12 2012 (IPS) - Opinions are divided in Morro da Providência, Brazil’s oldest favela, over construction works for the 2014 FIFA World Cup and the 2016 Olympics. While some residents are optimistic about the improvements that lie ahead, others point out that hundreds of dwellings will be demolished. “SMH means Secretaria Municipal de Habitaçao (Municipal Housing Secretariat) which is the agency that is going to evict us,” Morro da Providência resident Jailce Felix dos Santos told IPS. “It’s depressing. Many people have fallen ill. Arriving home and seeing those letters and knowing that your house is marked for demolition is terrible,” dos Santos, whose house was marked even though the area is regarded as part of the city’s historic heritage, told the press. A total of 832 houses have been earmarked and 140 have already been demolished, according to the Port Community Forum, made up of people in Rio’s port area affected by works being undertaken for the 2014 FIFA (International Federation of Association Football) World Cup and the 2016 Olympic Games. The Rio de Janeiro city government says the house clearing is necessary to build an overhead cable car across the favela that will connect to the “Central do Brasil” railway station, Rio’s most important train terminal and a transport hub. But as the favela has some of the most beautiful views of Rio de Janeiro, it will also attract large numbers of tourists. A funicular tram that will take people to the top of the “morro” or hill, and other works such as a sports centre, sanitation and upgrading of the roads, most of which are so narrow as to be barely passable, are also being built. Jorge Carvalho, who has worked as a dockhand at the port – which is also being upgraded – for 45 years, pauses for breath on a landing of the steep stairway of nearly 200 steps that is currently the only way up into the favela. But another local resident, who preferred not to be identified, said he had nothing to be happy about, because the house where he has lived for over 40 years, and which he now shares with seven relatives, has been marked for demolition. He built it brick by brick, and said the money the municipal government is offering as compensation is too little, while the alternative housing they offer is too far away from his place of work. But the main issue for this resident, who took us proudly around historic places in the favela, is how the planned transformation will wreck a neighbourhood regarded as part of the city’s history. The Morro da Providência, where the earliest settlements date back to the late 19th century, was the first favela to emerge in Brazil. 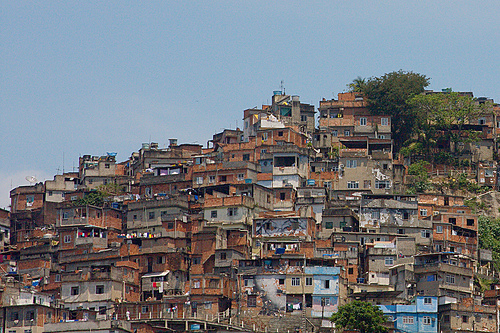 The origins of the favela, located between the “Central do Brasil” and the port district, date back to another instance of housing injustice in the history of Rio, formerly the capital of Brazil. The national government failed to make good its promise to provide housing for soldiers returning from the 1896-1897 War of Canudos – a civil rebellion against the central government, in the northeastern state of Bahia. So they occupied the hill they called Morro da Favela and built their own houses. According to historical accounts, the word favela was probably taken by the soldiers from the Alto da Favela, a hill overlooking Canudos that was named for a shrubby local tree. Some of the existing buildings, like chapels and churches, date from that time. The earliest houses were made of clay, so it is easy to identify their ruins. Morro da Providência was also the cradle of one of the first “escolas de samba” or samba schools in Rio’s carnival. Dos Santos sold a bar she owned, where funk and other music popular among young people in the favelas is played, and opened another called “Favela Point” close to one of the cable car stations, anticipating the arrival of foreign tourists. Morro da Providência, the scene of new “battles” between drug trafficking organisations and the police in the 20th and 21st centuries, is one of the favelas in Rio where “Police Pacification Units” (UPPs) have been set up. But as someone who was born and raised in the favela, she is compelled to recognise the “sad” side of the “progress” that has arrived and the changes that her community will have to accept, not just in physical terms. “They are taking away our friendships, and creating distances between people,” she said. But while some people are happy with the changes, no one can hide their distress over the forced departure of those whose houses are marked. “They will have to leave at a moment’s notice, after living here all their life,” she said. In some cases, the Rio de Janeiro city government argues that the evictions are for safety reasons, because the houses are built where there is a risk of landslides. But in the view of Caroline Rodrigues da Silva of the Port Community Forum, this is just another chapter in real estate speculation that has unleashed an endless spiral of price rises in property sales and rentals. “There are two major issues behind it. One is state violence that legitimates the implementation of the infrastructure projects. An example of this are the UPPs in Rio de Janeiro, deployed only in the favelas that surround the sites of the big sporting events. This is a city for sale. The population control measures are to make people accept what’s coming,” Rodrigues da Silva said in an interview with IPS. “The other is the use of public spaces that had been left aside for many years. Now, that land has become valuable and the entire area has been restructured, so there is more and more speculation,” she said. The people who know this best are the residents of Morro da Providência, who lived with the effects of neglect by the state for decades, and now fear that after the mega sporting events, they will once again be forgotten. Progress implies change, which sometimes can be radical. Stories of lives are transformed. Such is life.